After another wet morning along the coast, the heavier rains have mostly stayed offshore this afternoon. The big question now becomes: Will Thursday morning offer a repeat performance of Tuesday and Wednesday morning super soakers along the coast? We hope not, and we think not. But alas, we are not certain. The National Weather Service has issued a flash flood watch for coastal areas that extends from midnight tonight through Thursday evening. The weather service expects an additional widespread 1 to 2 inches with isolated 4 inches of rainfall are possible across the watch area. This seems about right, but for the most part, we don’t expect quite the punch we’ve seen the last two nights where areas such as Dickinson, League City, and Kemah have seen a total of eight inches. But given the moisture available in the atmosphere we can’t rule it out. Also of note: We’re continuing to watch Invest 95L, which could become a tropical depression on Thursday in the Gulf of Mexico as it moves toward the southern Texas coast. However, we still don’t anticipate major effects for Houston at this time. That could change, of course. But at this point we’d sooner bet on a partly sunny Sunday than we would on a complete washout this weekend. We’ll be back with a full forecast early tomorrow. Anniversary Awareness: Ten years ago today we were watching the approach of Hurricane Ike, whose winds and storm surge pushed into Galveston on Friday, Sept. 12. 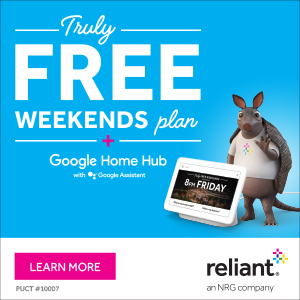 I recall this time vividly, as I tried to grab a few hours of sleep in a darkened room in the Houston Chronicle‘s former downtown newsroom. Next door, at the Lancaster Hotel, a window blew out in my family’s room. I was powerless to help. Similar dramas played out across the region as the storm made a final landfall at 2:10am CT on Saturday morning. 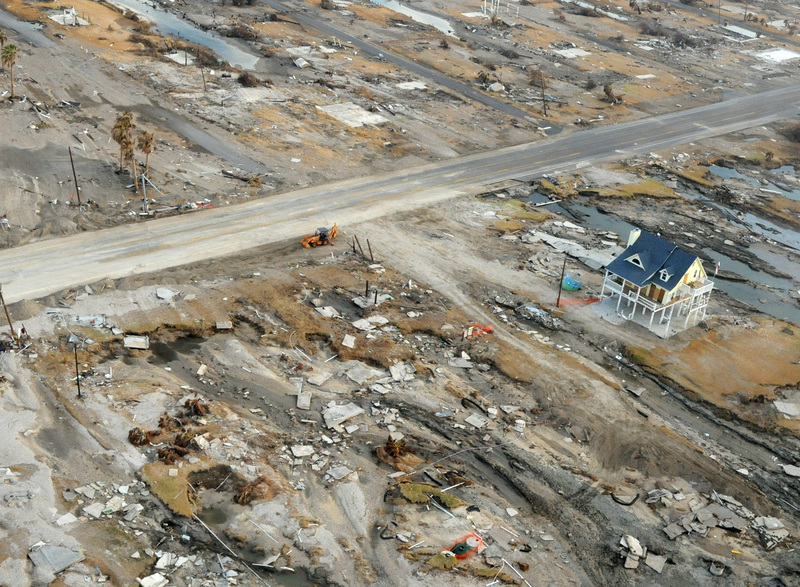 At the time, Ike ranked as the second costliest hurricane in U.S. history, behind only Katrina. It has since been bumped down to sixth, supplanted by Harvey, Maria, Sandy, and Irma. Unfortunately, the Houston region has yet to heed the lessons of Ike and enact any kind of surge barrier that would protect communities along Galveston Bay, expensive infrastructure along the Houston Ship Channel, or Galveston Island. The region remains highly vulnerable to a major storm surge event. On a personal note, a lot of the lessons I learned while covering Ike have made this site what it is today. And now, the forecast. We’ll break this down into three parts: Rainfall potential for Wednesday and Thursday, Invest 95L and this weekend’s weather, and finally, a tropics update on the terribly threatening Hurricane Florence and, for now, a fading Tropical Storm Isaac. As anticipated, rain showers developed offshore early Wednesday morning and have begun moving inland into Matagorda, Brazoria, and Galveston counties. Although these storms are less intense and widespread that rains on Tuesday morning, they are nonetheless hitting some of the areas most affected by the earlier rains. Caution is urged on roadways in coastal counties and a Flash Flood Warning is in effect until 8:30 am CT. This pattern will likely more or less continue, with coastal areas picking up an additional 1-3 inches on Wednesday and Thursday, with higher isolated totals. Inland rainfall totals should, for the most part, be significantly less than this. After an on-again/off-again dry summer in the Houston area, the last 10 days have felt like we’ve been dodging a continuous faucet. We will continue to deal with this into later this week and weekend. 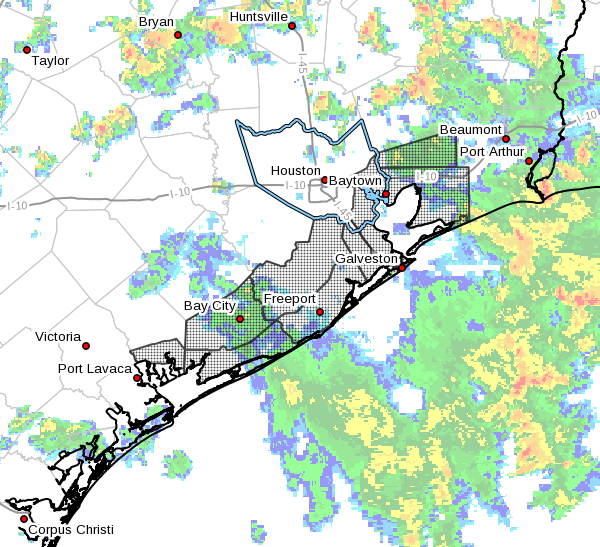 A Flash Flood Watch is in effect generally along and southeast of US-59, so primarily for the coastal counties in our area until later today. A watch means flooding, especially street flooding, is possible. We’re expecting periods of rain, possibly heavy at times, through tomorrow, with a bit more possible Wednesday and Thursday. Our Caribbean/Yucatan tropical disturbance (Invest 95L) remains disorganized this morning. The National Hurricane Center (NHC) gives it a 60% chance of development as it comes across the Gulf later this week. We think the ceiling on intensity is low, but this system does bring more locally heavy rain risk to parts of Texas. As I write this morning, heavy rain is south and east US-59, mainly impacting coastal Brazoria County and much of Galveston, and Chambers Counties. A Flash Flood Warning is posted for the west shore of Galveston Bay through Texas City back into western Galveston County. That goes until 7 AM, as they’ve seen healthy amounts of rain in that area overnight. Look for rain to continue this morning, though with perhaps a gradual focus more to the east or offshore. It’s possible areas north and west of Houston stay quiet much of this morning before some scattered downpours this afternoon. The most likely area to see rain continue at a healthy pace at times will be along the coastline or near Galveston Bay. Additional rain of one to three inches is possible along the coast and just inland. If rain hugs the coast longer than expected this morning and afternoon, totals could be higher in Galveston through Freeport. Areas north and west of Houston will see more sporadic, scattered amounts of less than an inch in most cases. 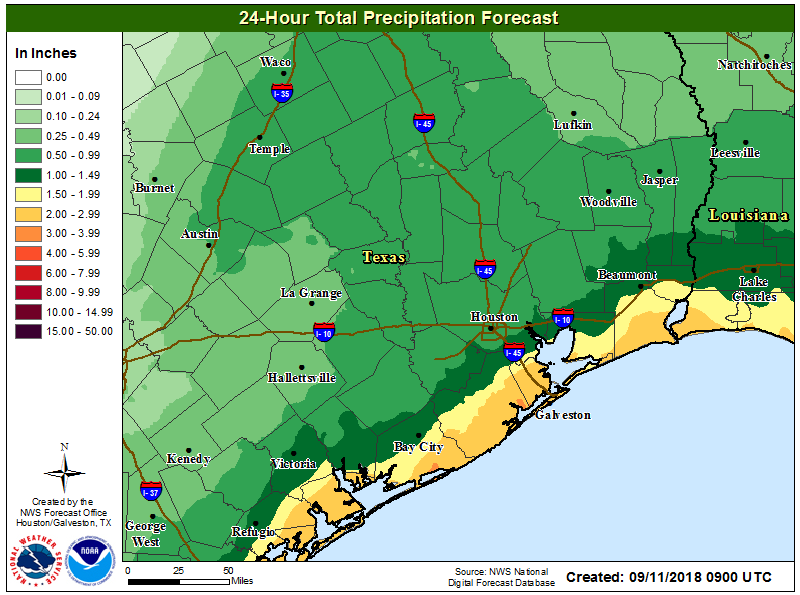 More rain will be possible tonight, once again along the coast, however we expect the heaviest rain tonight to stay south and east of Houston and mostly offshore. Flash Flood Watches are expected to expire as long as that remains the case We’ll re-evaluate that later today and probably have a brief update for you this evening and let you know if NWS extends the Flash Flood Watch through tonight for the coast. From this vantage point, the forecast for Wednesday and Thursday is pretty straightforward: Scattered showers and thunderstorms are likely on both days. We still need to iron out specifics and details, but expect more pockets of locally heavy rain, though they aren’t expected to be widespread at this point. Just a generic, “It’s probably going to rain at a few points between both days” will have to suffice for now. Clouds and rain are at least holding down temperatures. Look for temperatures to range from the upper-70s to around 80° if it stays cloudy and dreary all day to the mid-80s if we see some occasional sunshine. Tropics sizzling, but Houston threats seem manageable. Probably. A solid round of showers and thunderstorms rolled through Houston on Monday during the daytime, dropping 0.5 to 2.0 inches of rain for most of the area. It now seems likely that the radar will quiet down for most of this evening, before heavier showers being to develop along the coast on Tuesday morning like on Monday morning. 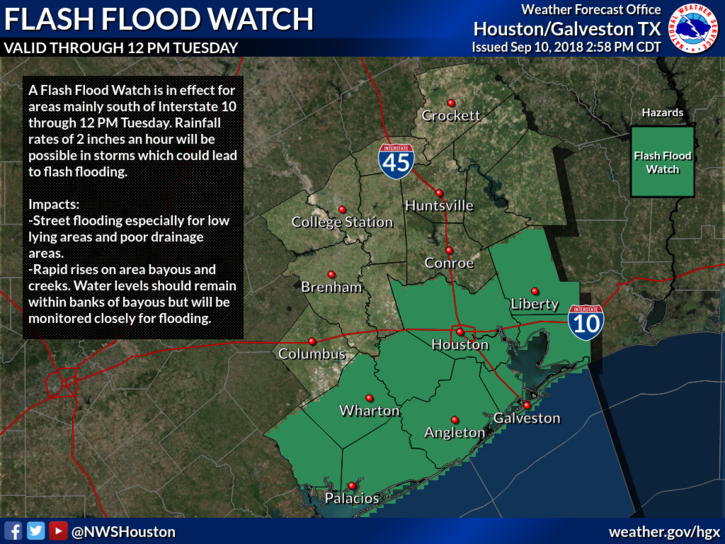 The National Weather Service has prudently kept a Flash Flood Watch in place for coastal counties, and the inland tier including Harris County, through noon Tuesday (Note: after this post was published Monday afternoon, the flood watch was extended until 6pm CT Tuesday. Our forecast remains unchanged.) The best hope is that the heaviest precipitation stays just offshore, rather than migrating on shore during the next 24 hours or so. Unfortunately, rain chances are not going to go away on Wednesday and Thursday. Although rain showers should be more scattered in nature, and perhaps less intense, we definitely can’t rule out locally heavy rainfall due to the tropical air mass and overall stagnant pattern. Given all of this, we expect accumulations of 1 to 3 inches for inland areas from now through Thursday, with 2 to 5 inches more likely for areas immediately along the coast (with higher isolated totals). The primary threat should be street flooding rather than significant stream and bayou flooding.